Here is the brand new poster by John Warner of the J Dub All Stars for Amandla. 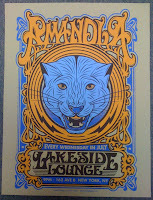 Amandla is comprised of members of Ween and will be playing every Wednesday in July at the Lakeside Lounge in New York. This very limited edition 4-color print will be available at each of the shows. 50 of these limited edition prints we screened on 19"x25" oatmeal French Paper cover stock. Do you like indie films? Do you like M.Ward? If you like indie films you probably know actress Zooey Deschanel from roles in Almost Famous, Yes Man, The Happening and Elf. MWard is an accomplished artist and producer who has released several fantastic solo albums and also teamed up with Conor (Bright Eyes) and Jim James (My Morning Jacket) to form the recent super group Monsters of Folk. Together, M.Ward and Zooey make up She & Him. 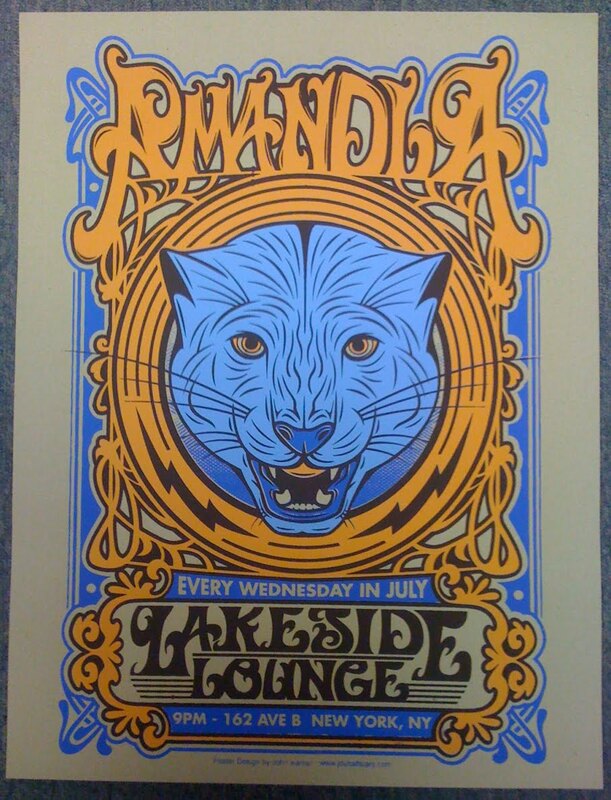 ABNRML was lucky enough to produce this print for She & Him's show at Penn's Landing in Phildelphia on 7/9/10 for Live Nation and the band. We enlisted the help of Philadelphia based Joe Castro to bring this 3-color print to life. It is printed on 19"X25" mint French Paper cover stock. 100 of these babies were produced, 50 are available at the band's merch store at the show. A few remaining copies will be available from Joe or ABNRML.